Golden Apes - The Langsyne Litanies EP Ltd.
Langsyne Litanies by Golden Apes is a title which is not an EP anymore, but not yet a full-scale album. Mostly it contains remixes of songs from previous records in acoustic versions, some other tracks are completely new compositions. Eight songs maintained in a rather monotonous mood, nothing surprising or innovative, but in overall they sound quite nicely. Let's take look at each of them. The first position, "Devil" from album Riot, brings the atmosphere of the true acoustic album - classical guitar, cello, piano... As for the vocal, it sounds tighter now and thanks to that you can experience and hear the message hidden in the lyrics. Classic measures and occasional playing with rhythm takes a listener to things previously masked by a heavy layer of electronics and powerful guitars. The second one, "Rosary", which begins from raw drum bits and bass sounds of acoustic guitar, practically repeats what was heard in the first track. Nice sounds that highlight the charm of lyrics sung by Peer Lebrecht. Nothing more, nothing less - well, maybe vocals in the background are unique on this particular album. Third, "Blind-Eyed Boy" that begins with simple guitar and vocals supported by deep sound of the cello, has interesting drums solutions - unfortunately not in meaning of rate, but rather using more variety among the classic 4 and a few more instruments than drums. Fourth, "Ferryman", starts with audio spots mixed with piano, but not for long - soon comes classic bit, cello, guitar and melodious voice of Lebrecht. Despite wide melody amplitude, the track is quite monotonous and not catchy. At the end of the song several instruments interrupt mentioned earlier audio spots. This and previous track, No. 3, are from album "The Geometry Of Tempest". "Digging Towers", is a calm, melodic ballad with the solo cello at the beginning with accompaniment of the piano and the guitar. Lebrecht vocal is deep and emotional - getting involved and feeling the lyrics, this is what decides about the value of a singer. And here the singer earned a medal. Actually this track would be a perfect "last track" on the album, but the authors decided to put it as the third from the end. Well let's then see, what else they have to say. The original track can be found on the album "Denying The Towers Our Words Are Falling From..."
Seventh "White Days" (from "Riot", 2012) is as calm and melodic as the previous one. This track is not a typical ballad because of the bit getting going, but it has: piano, guitar chords, long cello sounds. In fact, we can say that the "White Days" is quite monumental. Songs like this, sound great live. This one could also be the "last track". The last one, "The Infinity Called Man", begins with disturbing harmony created from random notes, audio spots, tremolo violin which emerges from nowhere (it's a fast repetition of one sound, in this case at fingerboard which gives the effect of a metallic sound)… They evolve into folded harmony, the dialogue between the piano and the guitar, in the background you can hear the tubular bells and cello. What is beautiful in this song? The fact that music speaks for itself - there is no vocal part. Golden Apes is a formation that works best on stage during live concerts. Two years ago in Wroclaw, playing as a support for XIII Stoleti, they delighted the audience by making maximum use from acoustic capabilities of famous Firlej sound. As for the "Langsyne Litanies", it is not something that will fall in memory. Not suitable for those who are looking for new sounds. 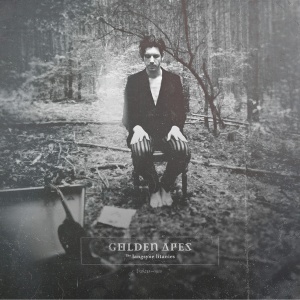 But fans of Golden Apes should be satisfied - classical measures, good melodies, lyrics, deep Peer Lebracht voice. "Langsyne Litanies" is a worthy position in band's discography - shows the compositional artistry not disturbed by volume of electronics and powerful guitars. It's just a good acoustic record.